It's said that the key to sticking to your New Year's resolutions is making a series of small changes. A couple of months into 2019, we've rolled out several enhancements (some small, some not-so-small) that will add up to make our service more caring, dependable and efficient. It's a new year, and a new United. Different people have different needs when they travel, so for us, 2019 is all about providing more options and making it a little easier for you to customize your flight experience. Now, for travel starting March 30, you can book a United® Premium Plus seat for trans-Pacific or trans-Atlantic flights as well as flights from the U.S. to select destinations in South America.  United® Premium Plus seats are located closer to the front of the aircraft and offer a little more space to stretch your legs and arms, as well as more recline. There's also upgraded dining, free alcoholic beverages, larger entertainment screens, in-seat power and extra amenities to keep you comfortable and refreshed. We've all been that person trying to schedule a flight around the big game or the season premiere of our favorite TV show. Now, on all aircraft with seatback TVs (a little over 200 of the jets in our fleet), you'll be able to watch live television for free. More than 100 channels will be available to customers through DIRECTV®. One of the most important aspects of being an airline is simply flying quality aircraft. This year, customers will see new additions to our fleet that are setting an even higher bar for reliability and fuel efficiency, meaning they'll help decrease our carbon emissions. And it's not just about operations — we're also working on ways to make flying more comfortable. We're proud to have the most-downloaded app in the airline industry. And since so many people are looking at it, we decided to spruce it up a bit. If you haven't checked it out since we released the latest version, give the updated design and new content a spin. The latest addition to our club and lounge network is the new United Polaris® lounge at Los Angeles (LAX). It offers daybeds with Saks Fifth Avenue amenities, shower suites and even a valet to steam your clothes upon request. Upscale food and beverage selections change seasonally with inspiration from local California cuisine. On the opposite coast, the United Polaris lounge at New York/Newark (EWR) caught the eye of CNN Travel, which listed it among "super-luxe airport lounges that may make you miss your flight." Today, we announced the next step in our commitment to making more customers more comfortable by adding more than 1,600 United Polaris® business class and United First® seats to nearly 250 international and domestic aircraft. Additionally, we will revolutionize the regional flying experience by becoming the first airline in the world to welcome the two-cabin, 50-seat Bombardier CRJ 550 aircraft to our fleet, offering customers on key regional routes more legroom, storage and amenities than any other 50-seat regional aircraft operating today. Offering a premium cabin experience at every step of your journey. This one-of-a-kind aircraft will operate routes to and from Chicago O'Hare this summer, followed by New York / Newark. We'll be further investing in the premium cabin experience by enhancing three additional aircraft types with more United First and United Polaris® business class seating. with all joining our fleet by the end of 2020. 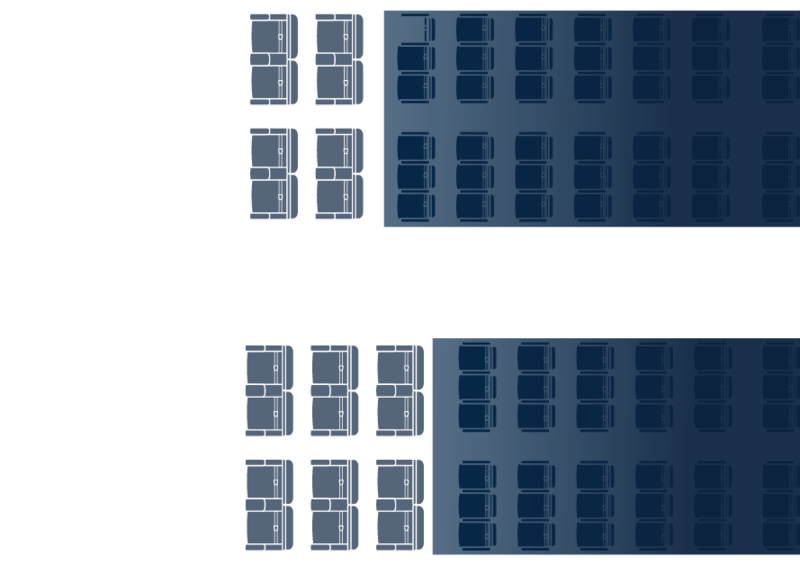 With these enhancements, we will add 50 percent more premium cabin seats to more than 100 aircraft. Today, customers will be able to access the updated United app. With useful enhancements that provide intuitive assistance every step of the way, the United app still includes the features you know and love. And now, thanks to dynamic messaging, the updated app provides useful information throughout your journey whether at the airport or on the go. If you've enabled automatic updates, the United app will automatically update. Otherwise, you'll need to manually update the app to see the updated version. Once you've updated the app, you'll no longer be able to use the previous version. If your phone is set to auto-update, the app will automatically appear on your device and stay. Otherwise, you'll have the previous mobile experience until you manually update. 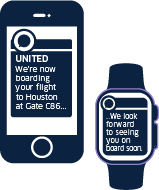 The United app will now display the most useful and relevant information throughout your journey. For example, 24 hours before departure, the home screen on the United app will prompt you to check-in. Once checked in, an option to get your boarding pass will populate right on the home screen so you'll no longer need to access it via the boarding pass tab on the current version of the app. All this information will now be accessible from a "My Profile" section, so you can see everything in one place. You can find the "My Profile" section by selecting the icon of a person in the top right corner. The new bottom navigation bar provides quick access to the most popular and helpful features. Find information about upcoming flights under the "My Trips" section that houses important information like your boarding passes and flight details. You'll also find an inbox icon section that stores important and useful information including gate changes, flight status updates and boarding alerts. You can also easily toggle back to your home screen from the bottom navigation bar. If personal device entertainment is offered on your flight, you'll see a tile titled Inflight Entertainment within the "Just for you" section on the home screen. The "Just for you" section will also give you access to other features such as how you can locate a United Club or how to earn award miles. You can also select "Wi-Fi & entertainment" from the More menu, located at the upper left hand of the app's home screen. You can access the seat map for your flight via Flight Status on the bottom navigation bar or within Trip Details — when you have an upcoming flight there will be an option to view the seat map. Any upcoming flights will be displayed in the Flight Status section of the app. There is no option to remove a flight as the Flight Status section will be automatically update itself two days after your travel is completed. There is no way to change the image on your home screen manually. Instead, the image will update once a day based on the destinations most commonly searched for by our customers. Today, Los Angeles' International Airport (LAX) welcomed the newest lounge to the United Polaris® family. Similar to its predecessors, the new United Polaris lounge offers elevated comfort and service from lounge to landing, providing our international premium cabin customers with a truly unique experience. With sweeping views of the airport and its surroundings, including the iconic space-age Theme Building, the new United Polaris lounge lets customers enjoy their preferences of three distinct experiences: an area to relax, an area to recharge and an area to engage. A custom scent, curated music playlist and subtle mood lighting all come together to create a memorable sensory experience. Visitors can look forward to a culinary journey with an inventive, seasonal menu that manages to be familiar and far-reaching at once. Food and drink selections include nods to both the local area and the popular destinations we serve from Los Angeles. Behind the menu is Chef Tritia Gestuvo who delivers a culinary experience that is welcoming and familiar with global flair, using her extensive culinary training under L.A. legend Joachim Splichal and more than 10 years of experience in French cuisine to develop these distinctly tailored offerings. This menu is a true reflection of the love and passion Chef Gestuvo has for her hometown. Customers can grab something from the buffet before boarding or settle in for a full meal in the private dining space, which sits up to 16 people. Whether indulging in the street taco trio or sipping on a High Altitude Bloody Mary, travelers have plenty of choices to fuel up for their long flight ahead. The focus behind the United Polaris experience has always been to provide our long-distance travelers with what they've asked for: better sleep in the sky. Hundreds of customers and employees were involved in more than 12,000 hours of research leading to the development of United Polaris. Through many focus groups and hours of on-the-ground and inflight product simulations — including overnight sleep tests for the new United Polaris seats — we explored a wide variety of product and service offerings and received feedback on what worked and what didn't. Only the best features went on to become a part of the United Polaris experience. The United Polaris lounge at Los Angeles' International Airport joins other lounges Houston's George Bush Intercontinental Airport follows closely follows the debut of the United Polaris lounge at San Francisco International Airport in April and the United Polaris lounge at New York/Newark last month. The United Polaris lounge at Los Angeles International Airport will open later this fall. Introducing an all-in-one travel partner that provides a more dynamic experience — the United app now interacts with you as you move throughout your entire travel journey. With enhancements that provide intuitive assistance every step of the way, the app still includes features you know and love. Enlisting the help of over 500 participants during our research and discovery phase, the feedback we received helped to guide the design as well as app improvements. And during the beta test phase, we expanded testing to include real users (we invited more than 1,000 employees and customers) to ensure the updates would drive the intended value. With 3,500 bookings created and 22,000 reservations viewed, we made sure the updates to the app were functional and helped to improve a user's overall experience. "As we continue to improve the customer experience, we are looking at our digital channels to create better experiences for our customers. We are reimagining the United app and giving our customers a more dynamic experience to make managing their travel seamless. The improved app includes several new useful enhancements while keeping the same features our customers know and love from the previous version of the United app," said Linda Jojo, Executive Vice President for Technology and Chief Digital Officer. The United app will open to the most useful and relevant information throughout your journey. For example, 24 hours before departure, the home screen on the United app will prompt you to check-in. Once checked in, an option to get your boarding pass will populate right on the home screen so you'll no longer need to access it via the boarding pass tab on the current version of the app. Once inflight, the app's home screen will update to display flight status and onboard entertainment options, making it even easier to find exactly what you're looking for. In the event of a connection, you'll also find directions from your arrival gate to your connecting gate on the app. If you've reached your final destination, information on where to collect your baggage will be displayed via the baggage carousel number. Updates to the app also include a new streamlined navigation bar at the bottom of the home screen, giving you quick access to the most popular and helpful features. The navigation bar will also include a My Trips button that will house important information like boarding passes and flight details. Additionally, you'll also find an inbox icon in the navigation bar that stores other useful and important information such as gate changes, flight status updates and boarding alerts. Also featured in the app is a profile icon in the right corner at the top of the screen. Accessing this icon allows you to easily find your account information, and any associated United credit cards and club passes. The updated United app is now available to download on the App Store, Google Play and through Amazon apps. Stay tuned for other additional enhancements rolling out throughout the year.